What the heck is this strange red rectangle doing in our galaxy? 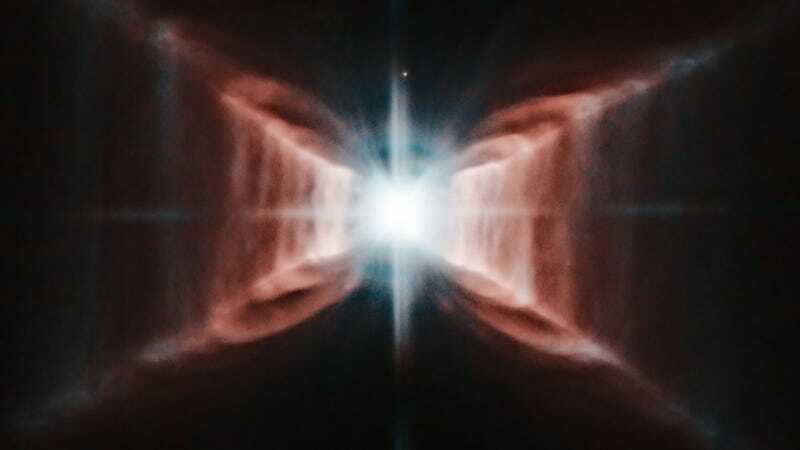 It's not often that a nebula looks quite so much like a cheesy special effect from some forgotten '70s sci-fi movie, but the Red Rectangle Nebula qualifies. After all, this seems to betray a total misunderstanding of basic science, because aren't nebulae meant to be, well, round? And is any nebula that blood-red? At the nebula's center is an aging binary star system that surely powers the nebula but does not, as yet, explain its colors. The unusual shape of the Red Rectangle is likely due to a thick dust torus which pinches the otherwise spherical outflow into tip-touching cone shapes. Because we view the torus edge-on, the boundary edges of the cone shapes seem to form an X. The distinct rungs suggest the outflow occurs in fits and starts. The unusual colors of the nebula are less well understood, however, and speculation holds that they are partly provided by hydrocarbon molecules that may actually be building blocks for organic life. For more on this and other amazing images of phenomena from throughout the cosmos, check out NASA's Astronomy Photo of the Day. ESA, Hubble, NASA; Reprocessing Steven Marx, Hubble Legacy Archive.